We spent the day at Downtown Disney. I didn’t want to do anything too strenuous, so the afternoon we played around at Disney Quest. It was a lot of fun! 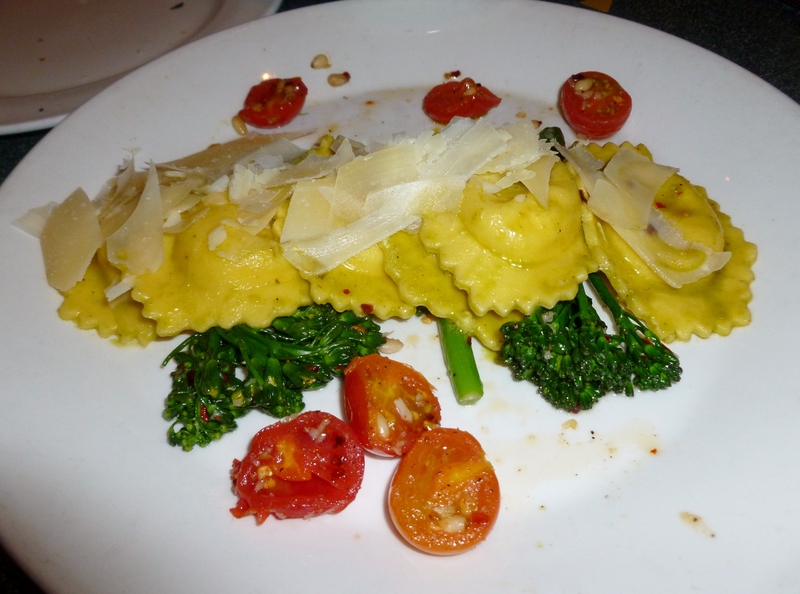 Then for dinner we headed to Wolfgang Puck Express with some of our friends who were also running the race. I ordered a pasta dish and indulged in the bread to load up on carbs! Then it was back to the room to lay all my stuff out for the next day and get to bed. I think I fell asleep around 9:30 – and the alarm was set for 3 am! I was so nervous and excited I didn’t even need the alarm, but got up all on my own. I’d been waking up every half or so waiting to see if it was time to race! I got my costume on and gathered all the stuff I would need. I ate a protein bar and then headed to the bus with my friends who were also running. We stayed at Art of Animation and they have buses running from all the resorts to the races in the morning. We were on the bus around 3:45 and in Epcot a little after 4am. There wasn’t too much to do before the race started. 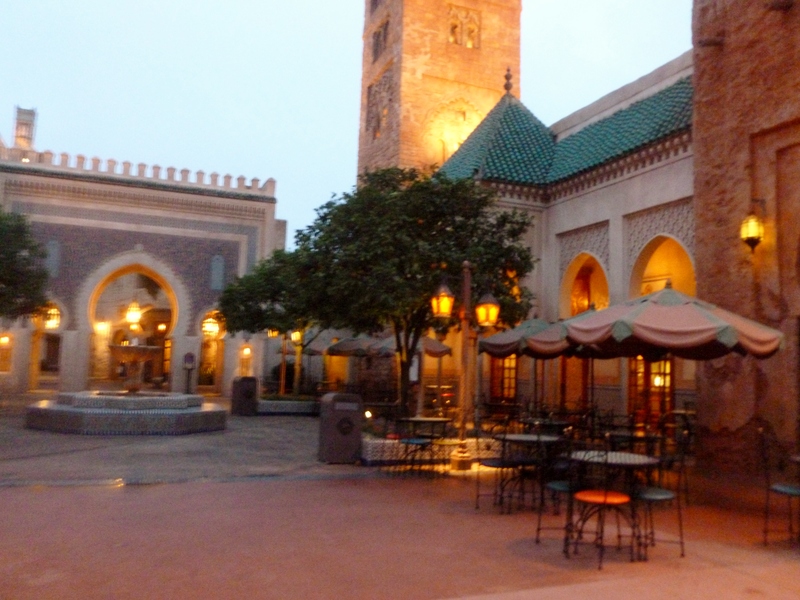 One girl dropped her bag off, and then we sat around and talked before getting into our separate corrals around 5am. There were 5 corrals, and I was in C, the middle one. The race officially began at 5:30am, after an introduction and pep talk from Jeff Galloway. Then the fairy godmother started the first wave and they were off! They waited 10 minutes in between each corral, which meant that I started at 5:50. Fireworks went off when each corral started! The first part of the course took us out of Epcot and along some of the roads. It was also the only area where there were really any uphill moments, but it wasn’t too bad at all. Right after mile 1 they had a character spot with The White Rabbit, but I didn’t stop. I did, however, take a break at the next character location, which was Meeko and Pocahontas! I probably waited about 3-4 minutes and then I was off again! After about 3.5 miles we finally got to go into Epcot. This was such an exciting moment! It had just started to get light out and the World Showcase just looked absolutely beautiful. There were also a number of characters out here too – the Christmas soldiers right before you got into the park, and then around the World Showcase there was Tiana and Naveen, Jiminy Cricket, and Marie from the Aristocats. I wasn’t stopping for any of them though. I wanted to get a decent time and only planned to stop again for a super rare character or Belle. From the World Showcase we were led right onto and around the Boardwalk, where I passed my husband with some of the other girls’ husbands waiting! I stopped for a quick picture with him – I’m sure he loved my sweaty face next to his 😉 When we finished going around the Boardwalk it was back into Epcot, and we were over 5 miles by this point. I was feeling pretty good, but starting to get hungry! My ankles were beginning to hurt too, something that was no doubt due to needing new running shoes. We passed some awesome looking light up statues of the Genie and Lumiere on the way into Epcot – speculation is that they may be used in the Festival of Fantasy parade. Almost at the finish line! 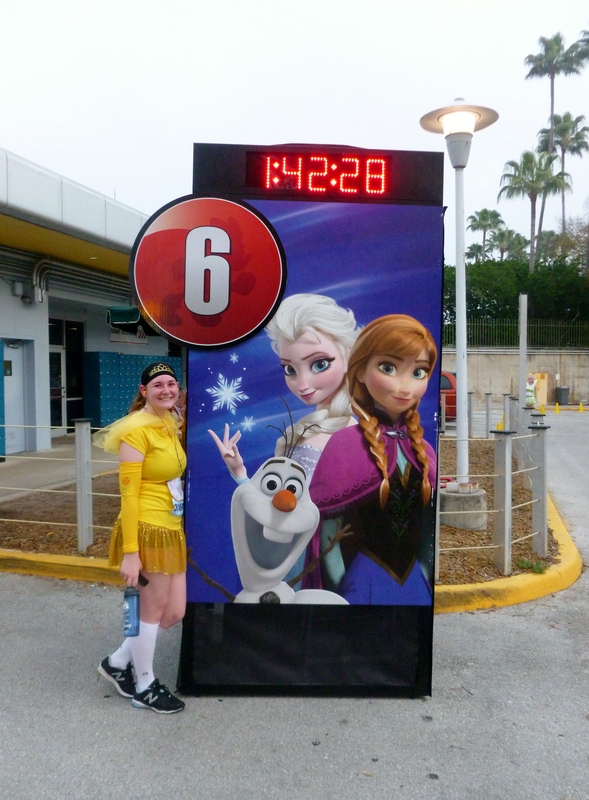 I stopped for a pic with the 6 mile sign, because I was proud of how far I ran and plus it had Anna and Elsa on it! There was almost no wait here, I think because people just wanted to finish. And before I knew it I was crossing that finish line! I walked on to get my medal, get a photo taken, and then was given a nice box of post-race snacks. Despite being hungry my stomach felt like it didn’t want to each anything… but I forced down a banana and felt so much better after that! My super fast friends that started in A had already headed back, but I hung around to wait for my friends that started in D and E. The husbands then came to meet us too! I finished the race in 1 hour and 23 minutes, with a pace of 13:24 min/mile. I’m very proud of myself! I felt good but I was also glad I wasn’t also running the Half marathon the next morning. 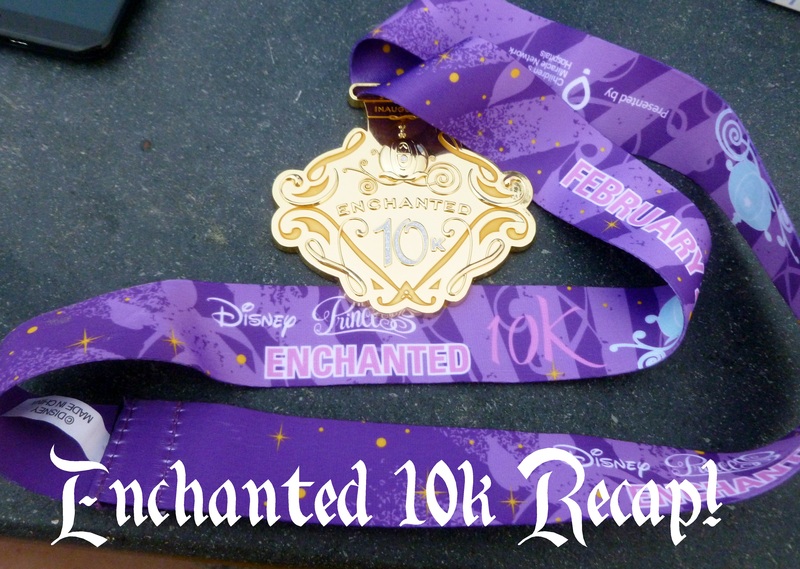 That would’ve been a bit too much for me – but I did sign up for the Tower of Terror 10 miler in October! 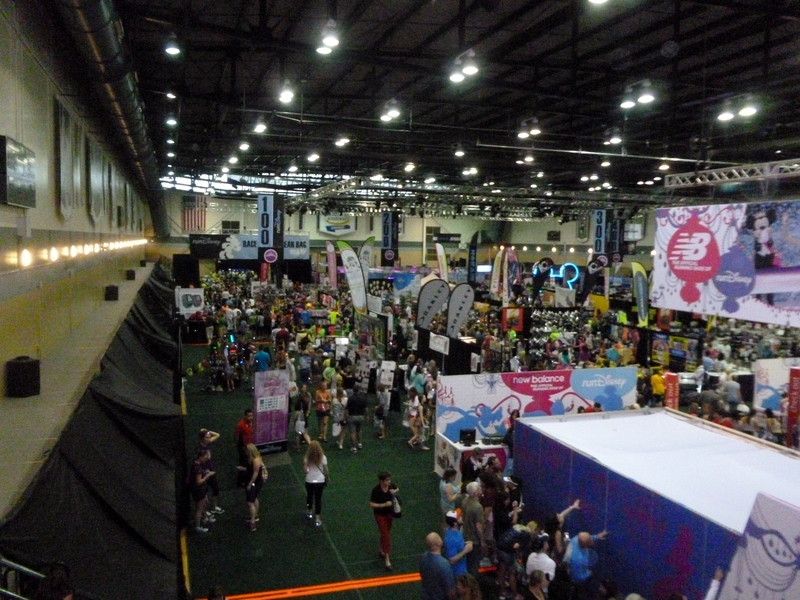 I can’t wait to do another Run Disney event! 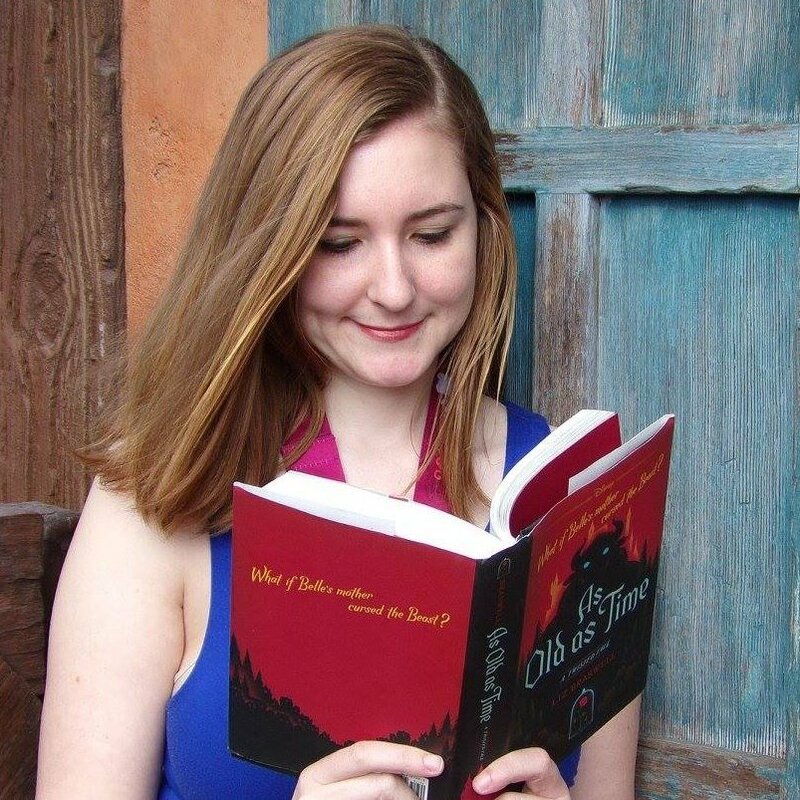 Have you run a Disney race? Which one is your favorite? Love the runDisney events! 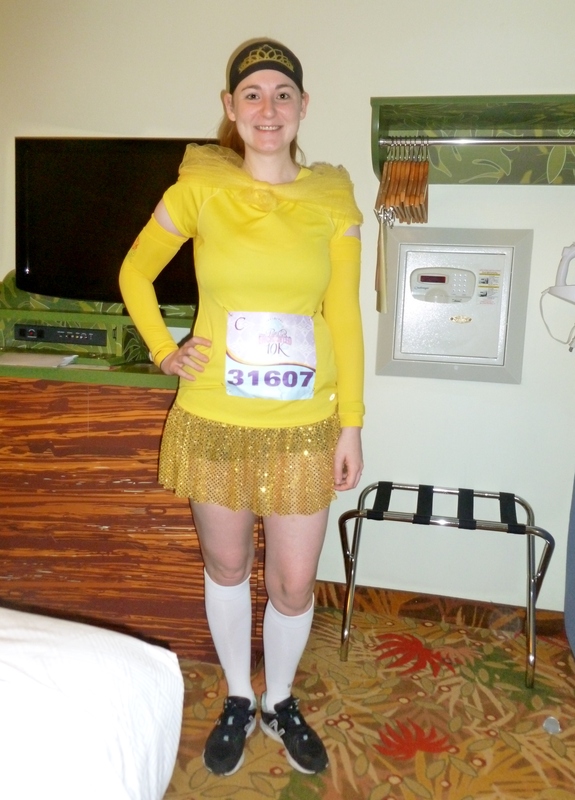 I just posted a review of my 2013 Wine and Dine half marathon experience…it was my first as well over 5k so fun!!! Congrats on your first 10k! Your costume was adorable!! I’m finishing my recap right now (I’m always behind!) And I’m signed up for ToT too! I have a feeling Jason didn’t mind your sweaty face. Oh how fun!! I didn’t realize they did those character stops!! I *really* wish they would do a walking option. I would LOVE to be able to participate in this, but running is not an option for me. I’m glad you had fun!! I loved seeing everyone wearing their medals throughout the week. Actually, a lot of people do walk the races. The only thing you have to make sure you do is you have to be able to keep a 16 minute per mile pace – not impossible if you’re walking, though not easy either! I do have some friends that walked the half marathon completely. 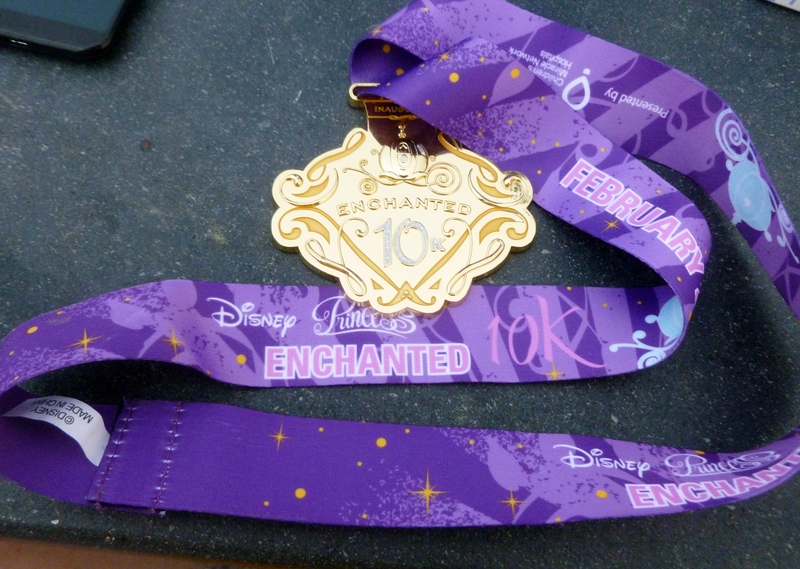 Or maybe even try a Disney 5k? I know they have character stops too and tons of people walk them – the race is short enough that they don’t enforce the pacing requirement. Loved the recap!! I love Run Disney races. 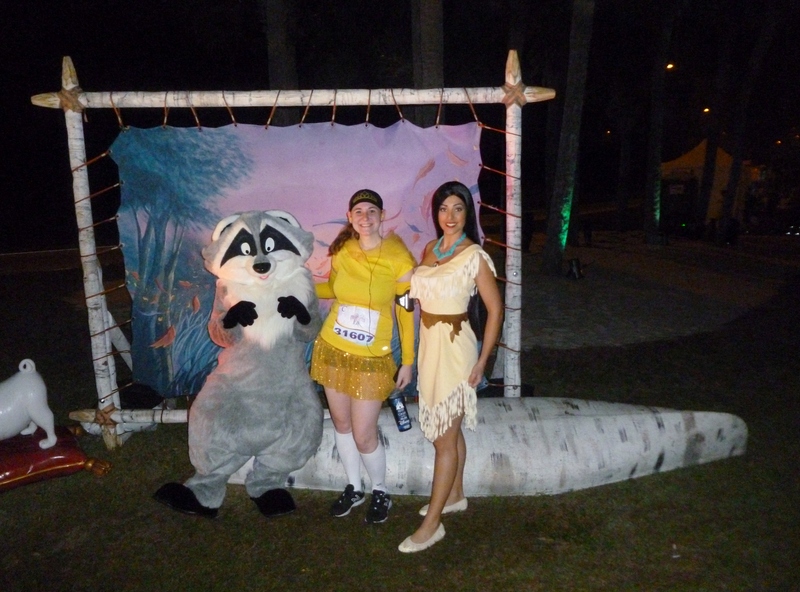 I did the glass slipper challenge and 5k and had a blast. 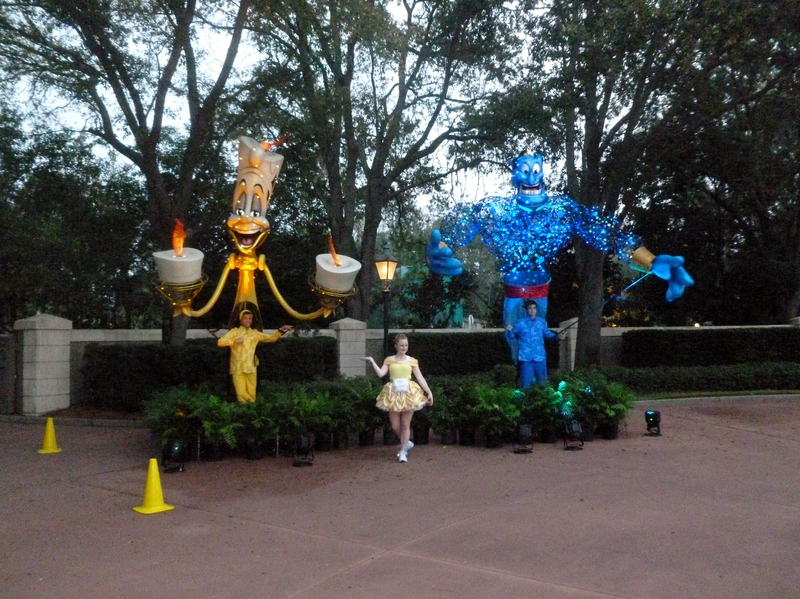 They have great entertainment and it is amazing to run through the parks! Running through the parks is so cool! It was really neat to be going through Epcot as the sun was rising.